Another one of Larsen’s stunning ship decanters, the Larsen Viking Yellow Cognac is a gleaming collector’s item inspired by sea voyages from long ago. It would make a wonderful gift, as the ship-shaped decanter will take pride of place in any drinks cabinet. It is crafted from Porcelaine de Limoges, and is hand painted with 24-carat gold by artisans. A unique Cognac decanter with delicious nectar contained within. The blend is a Fine Champagne assemblage, serving the same historically-unchanged spirit since the decanter was first introduced in 1952. The Petite and Grande Champagne are the most highly regarded terroirs in the entire region, and for good reason. The unique chalky soil and maritime climate provides the perfect conditions for producing very fine Cognacs such as the Larsen Viking Yellow. 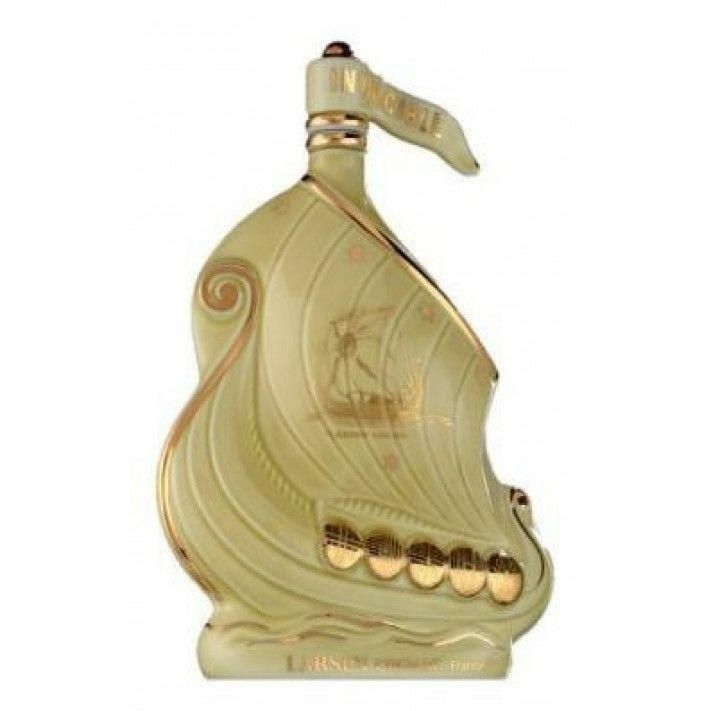 It is only fitting that the Viking Yellow Cognac should be in the shape of a ship. Jens Reidar Larsen set out to the Americas aged 24, eager to explore the world, but a stopover in Bordeaux seemingly changed the course of his path and destiny. He found a job in a town famous for its eaux-de-vie, and subsequently fell in love with a local girl. His new adventure began in the town of Cognac. He learned the secrets of the cellar masters and explored the treasures of eaux-de-vie, creating Larsen Cognac in 1926. This Cognac represents decadence and adventure, and is best enjoyed with a small group of your closest friends. Enjoy it neat to explore the Fine Champagne blend. The ship decanter is unlike any other. Adorned in a creamy lemon yellow and gold embellishment, the stopper is a flag denoting the word “Invincible”, and below are a number of crests on the shop.